'Lazy Dayz' is a one bedroom apartment which is part of our home with it's own separate entrance and patio. We are only a 2 minute drive from Picton Main Street where you can enjoy various bars and restaurants such as The Acoustic Grill, The County Canteen, Portabella Italian, and 555 Brewing Company. You can explore various Gift shops, Ice-Cream shops, Bakeries ....... the list goes on! Renovated to a high standard, our fully self contained, 1 bedroom apartment is fully equipped and ready to make your holiday memories. The apartment is on one floor with no stairs which makes it easily accessible, and you can park free right outside your door. 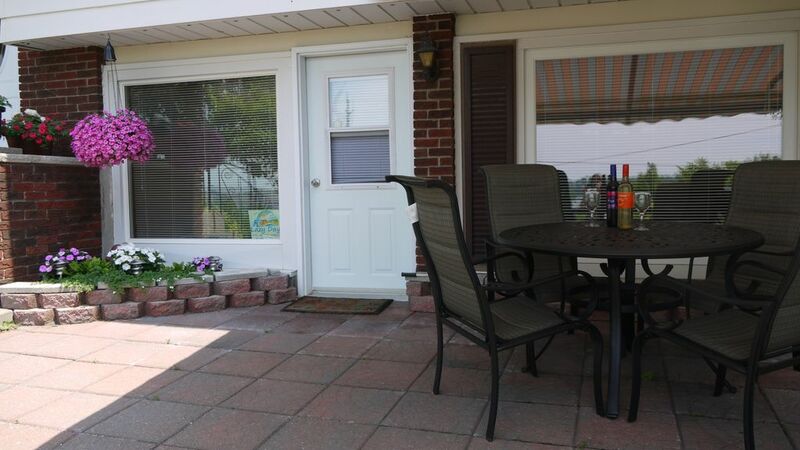 Take breakfast on your own deck, then relax in the evening with a glass of wine watching the sunset. A perfect end to a perfect day. Check in is anytime after 3 pm and check out is by 11 am. Please note this a self catering apartment - no food, or cleaning services are included during your stay. A small dog lives on the premises. She is a Havanese named Daphne who is very friendly. Hi there, we are Joanne and Michael. We are originally from the UK but are now lucky enough to be living in this beautiful part of Canada. We enjoy exploring this amazing area and never get tired of visiting the wineries, beaches and appreciating our surroundings. We LOVE living in Prince Edward County. In fact we wouldn't want to live anywhere else! We are located on the very pretty Glenora Road which boasts stunning views of Lake Ontario. Although we are very close to town, we like where we are because it's away from the hustle and bustle and a short drive to anywhere. 2 minutes drive from the main town of Picton, 10 minutes drive from the gift shops in Bloomfield, 20 minutes drive from the quaint village of Wellington and only 15 minutes drive from the beaches. Joanne and Michael provide a great home away from home atmosphere. Not only very clean and quiet but it is those little touches/extras that make the place a very relaxing and trouble free getaway. We will definitely be staying there again when back in the area. Our stay at Lazy Dayz was perfect. It was just as the pictures showed, with special welcoming touches, comfortable and clean. Our “ home” for 3 nights was just that- a relaxing, nicely decorated place to come home to at the end of a full day! Joanne and Michael provided very helpful information on things to see and do in the county. We enjoyed the shops in Picton which included the art gallery. That led us to some art studios, wineries and breweries and beautiful touring in the countryside, Wellington country market and fabulous Sandbanks Provincial Park. PEC has so much to offer! We definitely have to come back again and would welcome the opportunity to stay at Lazy Dayz! My husband and I were so impressed with this place. The location was perfect. We were on a motorcycle so we couldn't bring much with us but when we arrived there was coffee and tea, water and milk and even some fresh baked goodies. Joanne and Mike are obviously great hosts. The apartment was very clean, the bed was comfortable and the deck out front was so nice for sitting and enjoying a beverage and the sunset. I've already recommended the place to my mother in law and I'm just home 10 minutes. Prince Edward County was a joy to bike around and visit. We would definitely stay there again. Already missing the peacefulness and beauty of the County. Joanne and Michael so friendly and dropped by to check in on us once we checked in. They were incredibly helpful with their local recommendations of restaurants, wineries, etc. Also loved that we were just a short walk away from downtown. Their place was perfect for my friend and I on our girls weekend getaway. We had everything we needed and will absolutely miss the quiet mornings sitting on their patio having our morning coffee with breakfast. Everything was very clean and the bed was also so comfy! Already counting down till the next time we can come out and explore the rest of the county. Thanks again for everything! Thank you for so much for taking the time to write such a lovely review. It was a pleasure to have you both stay with us and we are pleased that you enjoyed it. Thanks again for leaving the apartment so beautifully clean and tidy. It's very much appreciated. Great location!!! We enjoyed watching the sun set over the bay. Very clean & the hosts were very friendly and helpful. We highly recommend this beautiful rental for a relaxing weekend away!